Motorists have gotten accustomed to seeing the price of gasoline go up at this time of year. Late winter to early spring is the time oil refineries do maintenance and switch over the summer grade fuel, reducing output and generally raising prices. But in the last week or so prices haven't been going up. In fact, according to the AAA Fuel Gauge Survey, they've actually gone down a bit. The survey shows the national average price of regular self-serve is $2.29 a gallon, down more than a penny from a week ago. The national average price of premium is $2.81 a gallon, also down one cent from last week. What's behind this pause in the seasonal price rise? Most likely it's the price of crude oil, which is falling like a rock. West Texas Intermediate crude is selling at around $48 a barrel, down from close to $55. Wall Street speculators were so sure oil supplies would get smaller because of OPEC's agreement to cut production they have lately bid up the price, which oil refiners have passed along to consumers in the form of higher prices at the pump. 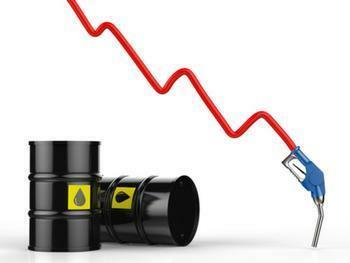 Now, Wall Street appears to be concerned that oil supplies aren't falling as much as they thought. As oil prices rose over the last few months, U.S. oil producers got busy, and output has been quickly rising. As OPEC supplies get smaller, U.S. supplies could get larger. The question consumers might be asking is, will it be enough to counter the seasonal rise in prices at the pump? Probably not. That's baked into the cake at this point. There can be plenty of oil to make fuel, but if refiners have made less fuel, the law of supply and demand would suggest the price would rise. But the rise should only be temporary and perhaps not as dramatic as in years past. Normally, prices peak around Memorial Day weekend. By then the refineries are usually back at full speed. That's when lower oil prices will begin to pay off for consumers. Meanwhile, not all parts of the country are seeing a temporary dip in seasonal gas prices, at least not yet. In California, the statewide average is $3 a gallon, about a penny higher than a week ago. But some states have seen a more dramatic decline. The statewide average in Illinois is $2.31 a gallon, down from $2.36 a week ago.